Now there is an even more colourful way to make household items or garden implements stand out. 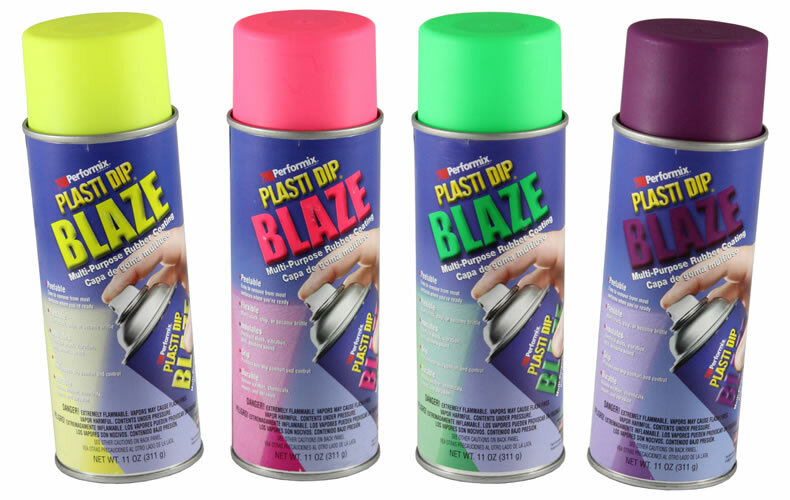 It’s called Plasti Dip Blaze, which is a new range of neon colours for this unique, handy product. Plasti Dip is a novel and ingenious way to cover just about any surface with a synthetic rubber coating that protects and insulates. The multi-purpose air-dry, synthetic rubber coating can easily be applied by spraying, brushing or dipping and, because it remains flexible and stretchy, it doesn’t become brittle or crack. The wide colour range has now been expanded to include the bright new eye-catching colours; Blaze Blue, Blaze Orange, Blaze Pink, Blaze Green, Blaze Purple and Blaze Yellow. The new Blaze collection, which comes in 311gram aerosol cans, applies just as easily as the rest of the Plasti Dip range to most substrates/surfaces to create a protective coating that is easy to grip and non-slip. Although they have only just entered the market, the new Blaze range is already selling well and several new Plasti Dip products are being lined up for launch in New Zealand in the near future. “Plasti Dip is such a useful product for bringing old household or gardens items back to life, there are literally thousands of uses for it,” says Bruce Walker, of Griffiths Equipment, distributor of Plasti Dip in New Zealand. Originally developed to apply plastic coatings to replace worn grips on hand tools, such as pliers, wrenches and cutters it has become a household name around the world. Provided they are dry and free of rot/rust, surfaces coated with Plasti Dip will resist moisture, weathering, corrosion, abrasion and some acids. It is claimed to be UV stable for between seven and ten years and can withstand significant temperature extremes. Once dried, Plasti Dip is very durable and will not slip, pucker or peel off the surface to which it has been applied. The Plasti Dip range is available from leading hardware outlets and automotive accessory retailers throughout New Zealand.